There is a beautiful Meyer Lemon tree in the yard of the carriage house I’m renting in downtown Napa. My landlords, who live in the Victorian on the property, have two young kids and don’t have the time to do anything with what grows in the yard. One Saturday in February, I got a ladder and a strong canvas bag and picked 140 lemons from the tree. 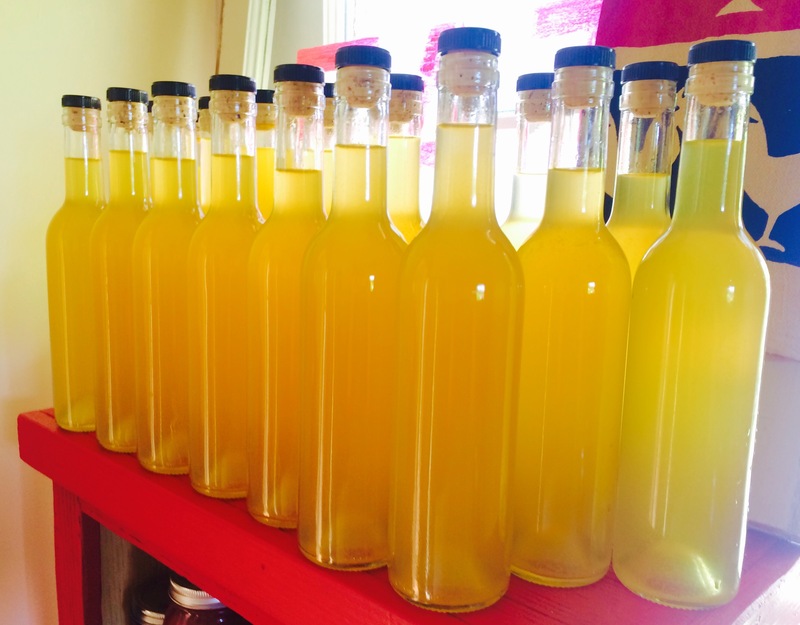 I zested 105 to make my very first batch of Limoncello. I used the juice from those to make lemon simple syrup and lemon curd. I used a 3 gallon glass carboy from my hard apple cider project a few months back to hold all that zest plus enough vodka to fill to the top. That was six 1.5L bottles. I put the stopper on, wrapped it in an old bath towel, and set it in my hall closet. A month later I took it out to add the simple syrup. Having realized I was an idiot and filled the carboy to the brim with zest and vodka, I drained off a half of a gallon to make room. BONUS – citron vodka! I add a simple syrup mixture of one to one sugar and water that brought the liquid back to the top. I rewrapped the carboy and put it back in to the closet. Six weeks later I tasted it. I was over the moon pleased with myself! It was smooth, full and tart with a punch of alcohol and hint of sweetness. I strained it off in batches through a chinoise into a glass pitch with a spout. Then I poured the liquid into 25 glass bottles of 375 ml each. After a few hours, some lemon particulates separated from the mixture and rose to the top. With a few shakes, they were reincorporated, but I’ll know for next year to line the chinoise with a cheese cloth.